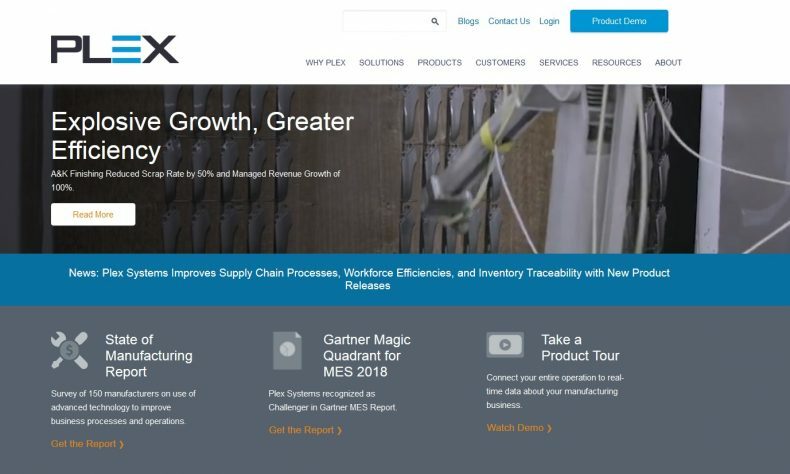 TROY – Plex Systems, the Troy-based developer of manufacturing management software, announced updates and enhancements to its software products that the company says will improve inventory management, enable manufacturers to access and contextualize more data, and support a mobile workforce. Improved Purchase Order Capability and Integration with Supply Chain Planning: This update improves responsiveness to factors that impact supply chain planning such as bill-of-materials revisions by allowing for open purchase order modifications at the line level. This also improves the materials resource planning (MRP) outcome. Enhanced Traceability of Components with Piece Serialization: The Serialized Piece Consumption and Trace enhancement gives manufacturers the tracking and visibility of the manufacturing genealogy and conditions of each serialized unit produced. Configurable Lot Certificates of Analysis: A new user interface allows manufacturers to build flexible, custom presentations of lot attribute data suited to the business’s industry, product, and even specific customers’ certificates of analysis (CoA) requirements. Lot Attribute Checksheet Integration: This enhancement allows users to map Part Lot Attributes to Part Specifications as well as automatically aggregate and push checksheet measurements to Lot Attribute Values. ROI Heat Maps and Widgets Added to IntelliPlex: IntelliPlex, a business intelligence tool that enables the creation of sophisticated reports and dashboards to help manufacturers make data-driven decisions, now has heat maps and other widgets designed to improve ROI calculations. Plex Mobile Voice Integration and Increased Functionality: Manufacturers can now control inventory movement with hands-free voice commands. Additional capabilities for customer shipping and inventory are also now available. Plex’s native mobile app Plex Mobile is available for download through the Apple Store, Google Play, and Windows Marketplace. Identity Access Management: This security update adds account activity, an authentication log, and an access control log to the previously released IAM offering. APIs for Sales Order and Shipping: Manufacturers can integrate commonly used fields with a third-party ERP. These additional APIs can be used on their own for point solutions or as part of a broader strategy to integrate Plex with a corporate system in a two-tier ERP environment. Industrial IoT: Plex’s Industrial IoT limited availability offering allows manufacturers to access assets through Kepware providing real-time visualizations of asset statuses with context from the Plex Manufacturing Cloud. Most system updates are made continuously with opt-in and preview capabilities, putting customers in control of which features they choose to use.